Deriving its horsepower from 1.2GHz Quad core processor, this Spice phone belongs to high-end category. The processor is accompanied by 1GB RAM. It is 5.3 inch phone. The display exhibits resolution of 960*540 pixels. With pixel density of 208 ppi, the screen looks good. Talking about its physical form-factor, the device measures 152 x 79 x 10.3 mm. It has 16 GB of internal memory. A 8 megapixel rear camera is present. It has front facing camera of 5mp. 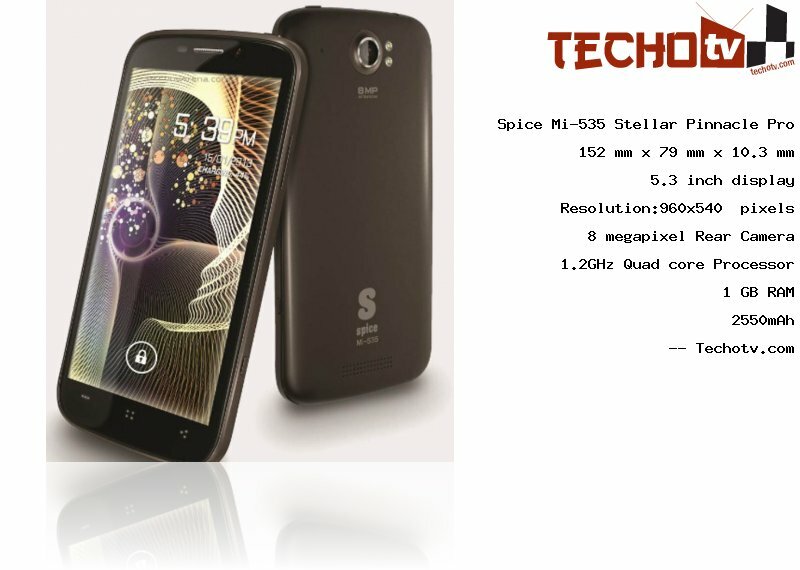 The Price of Spice Mi-535 Stellar Pinnacle Pro is Rs 14990. More pricing details from different online stores are not available at the moment. Sensors - Proximity, Magnetic, Gyro, Ambient light, G-Sensor. Several Camera modes - panaromic, pizzle, continuous shot, etc. Pop up play, smart dial, intelligent answer, boot acceleration, etc software features.